The Mercedes S-Class has ruled the luxury limousine roost for as long as anyone can remember, so can the latest Audi A8 topple it with its sharp style, lavishly-appointed interior and cutting-edge technology? 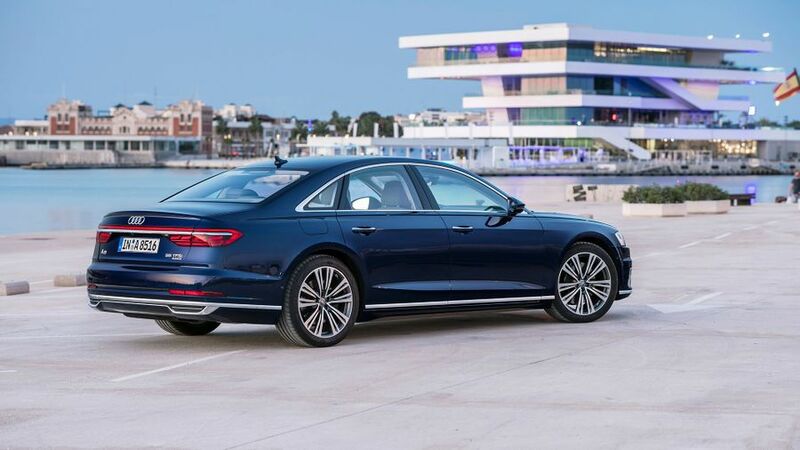 Even alongside other cutting-edge luxury saloons, the Audi A8 looks like a very impressive machine. It’s lavish and spacious to sit in, luxurious to ride in, good to drive and – law permitting – it can even drive itself for some of the time. Yes, plenty of the ground-breaking technology on show costs you extra, but even without it, the A8 is a fine luxury limousine. A worthy rival to excellent cars like the BMW 7 Series and Mercedes S-Class.  Interested in buying an Audi A8? Audi’s flagship luxury car paves the way for all of the brand’s other models when it comes to new technology, and the same applies to the way it looks. The huge, gaping single-frame grille is already fairly familiar, but the notched headlight design is new, as is the lowered shoulder line. 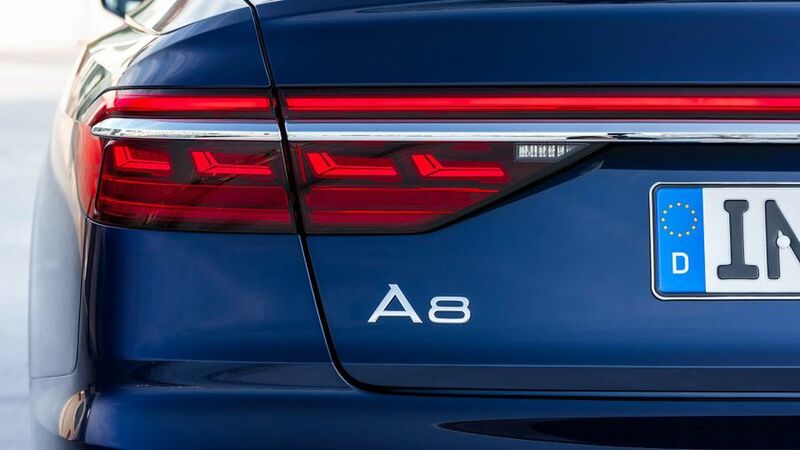 Perhaps the most distinctive feature on the latest A8, though, is the rear light design, which uses a single strip that slashes right the way across the rear end and wraps around at the sides. And, if you’re prepared to pay extra for the optional OLED rear lights, they do a funky animated swoosh when you turn them on. 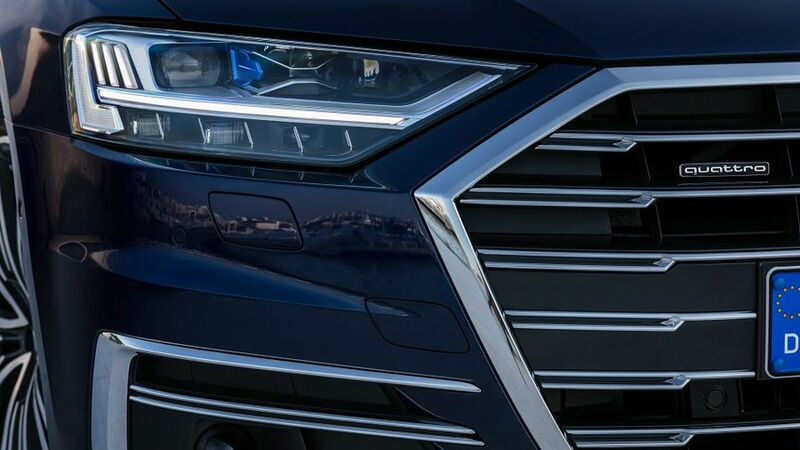 Even the standard A8 gets LED lighting at both ends, though, along with 18-inch alloys, metallic paint and chrome exterior accents. Audi is famed for the plushness of its interiors, and it’s always been the job of the A8 to display the best of the breed for quality. Even with that in mind, the latest model really moves the game on in this area. Every surface you see, touch or interact with is absolutely dripping with tactile and sensory appeal, and the way in which it’s all assembled is so solid and so substantial, and displays so much attention to detail that you’d swear it’ll last forever. The cabin also has a sharp, contemporary design that gives it an advanced, cutting-edge feel, and that’s helped no end by the vast amount of technology on display. 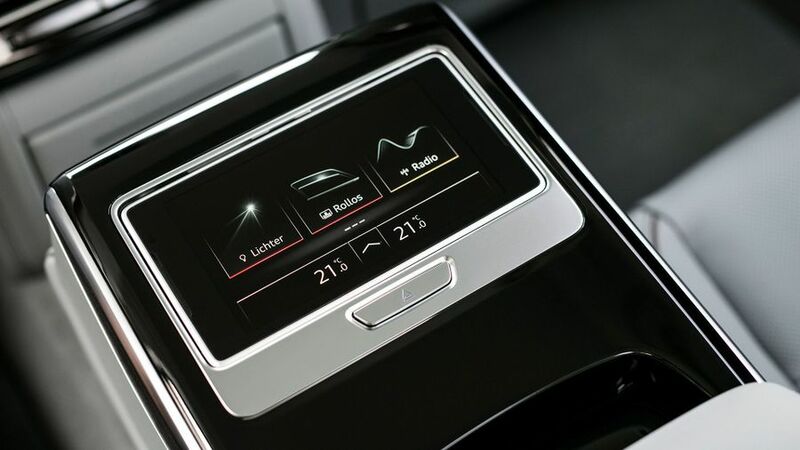 Audi’s ‘Virtual Cockpit’ digital dials are present and correct, as is a head-up display and two gigantic touch-screens on the centre console that deal with pretty much all the car’s complicated functionality. The buttons and dials that once helped you to use the function you wanted are no more. Not only do the touch-screens look really cool, but the graphics are super-sharp, and the software works really quickly. However, with the vast amount of different functions the system has to deal with, it will take a while to get used to finding your way around its finer points. On the other hand, finding a comfortable driving position is a piece of cake, because there’s electric adjustment on just about everything, and you have a clear view out in all directions, which is essential when you’re driving a car of such colossal size. What’s more, there are cameras and proximity-sensors all over the place to tell you if you’re getting uncomfortably close to an obstacle when parking. The whole point of a luxury limo is to whisk its VIP passengers to their destination in absolute luxury, and interior space is an essential part of that. Luckily, the A8 has an ace up its sleeve on that score, because it’s the largest car in its class in every direction. 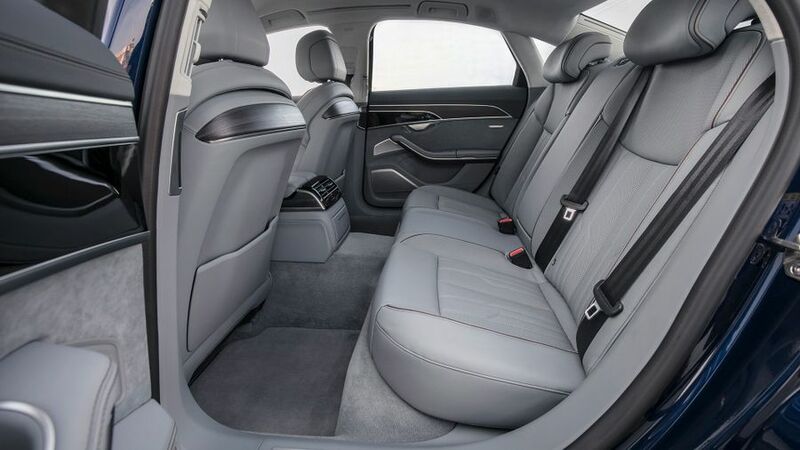 That means absolutely bags of legroom where it counts – in the rear seats – and there’s even more in the long-wheelbase version. Rear headroom is also very generous and, not that it’ll matter to whoever’s in charge, but there’s plenty of space up front for the chauffeur, too. At 505 litres, the boot is actually a fraction smaller than the one in the car it replaces, but it’s been reshaped so that it can accommodate three full-size flight cases, rather than just two and some extra small baggage. It’s also a fraction smaller than those in the BMW 7 Series and Mercedes S-Class, but it really is only by a fraction. Any limo worth its salt needs to give its occupants the most luxurious experience possible, and where on-road behaviour is concerned, that means an effortlessly comfortable ride and effective isolation from the noises of the outside world. On the first point, the A8 does a brilliant job. You get a sophisticated air suspension as standard, and when you set it to Comfort mode, it’s simply brilliant at absorbing lumps and bumps in the surface so you barely even notice them. It also delivers just the right amount of vertical travel, so you feel as if you’re wafting along luxuriously, but without the body feeling like it's bouncing around too much. Switch through the modes into the sportier settings, and the ride quickly becomes a good bit firmer, but you do get tighter control over body movements in return. That makes the car feel sharper along winding roads, and when combined with the impressive grip and traction you get from the standard four-wheel drive, it feels impressively capable and assured through a set of bends. However, this is a truly enormous car, and you’re always very aware of that size, especially on single-carriageway roads. The A8 is good on the noise front, too, with barely any road noise and only the odd burble from the engines when they’re asked to work a little harder. There’s a shade more wind noise that you hear in a Mercedes S-Class, but it’s nothing that’ll distract those in the back from their laptops or copies of the FT. If you’re willing to pay extra, there’s also an optional suspension system that’s even cleverer. It uses the car’s cameras to detect the size and shape of upcoming bumps in the road, and then it primes electronic actuators on each of the four wheels to raise or lower them as necessary to deal with the bump most effectively. It’s clever stuff, but we’ve not had the chance to try it out yet. 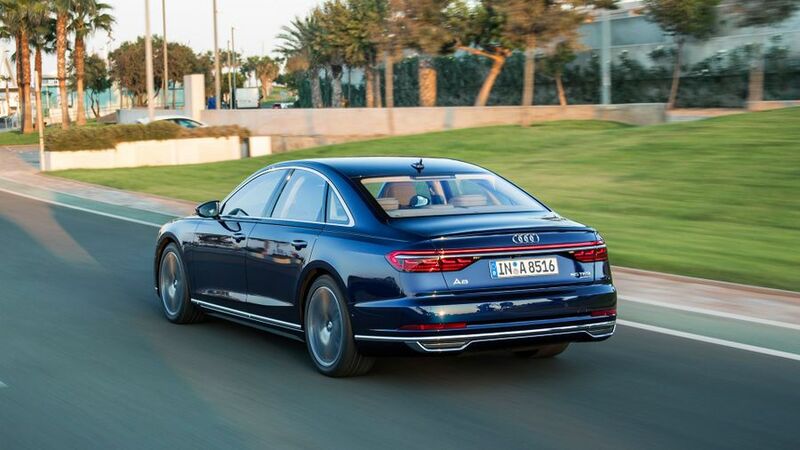 In the fullness of time, the A8 will be available with a range of engines that includes a pair of V6s (petrol and diesel), a V8 diesel, a W12 petrol and a plug-in hybrid that combines the V6 petrol with an electric motor. So far, we’ve only had the chance to try the V6s, and we can’t see a whole lot of reason to venture any further up the range. The 286PS diesel, which will make up the majority of sales, stays smooth and quiet for the vast majority of the time, only making itself heard when you work it hard. You shouldn’t often need to, though, because it’s pretty eager at low revs; and, even when you’re going faster, revving it hard doesn’t ultimately result in that much more pace, anyway. As with all the best chauffeur cars, it’s best to just sit back and adopt a relaxed approach. Things are a little different with the 340PS V6 petrol. Overall, it doesn’t feel a whole lot quicker than the diesel (a feeling that’s supported by the stopwatch), but it does respond better to having a few more revs on the dial and it’s a little smoother and quieter when you oblige. Like all A8s, it comes with an eight-speed automatic transmission as standard, and it’s very slick indeed. 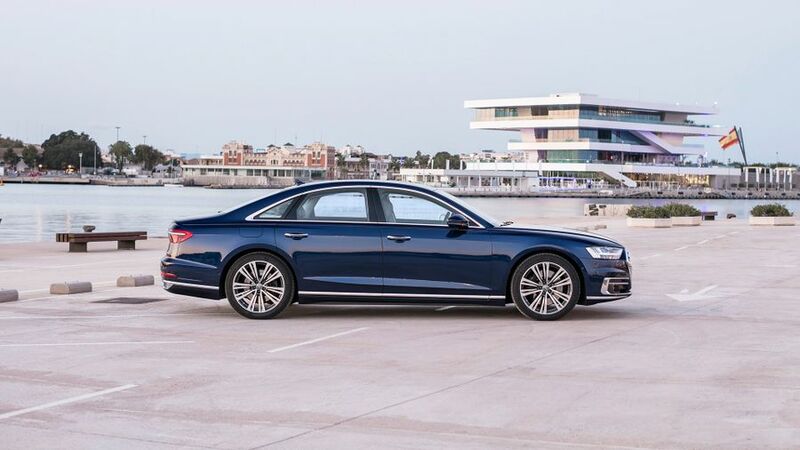 The A8 costs a very similar amount to the BMW 7 Series to buy, and a bit less than the Mercedes S-Class, although when you’re talking about these kinds of sums, the differences are minuscule. Critically, the resale values of the three cars are also very similar, so depreciation – which has the biggest overall effect of any running costs for all motorists – is broadly similar across the board. Fuel costs and CO2 emissions are slightly higher on the Audi than they are for the equivalent BMW and Mercedes, too, but again, the differences are very unlikely to be deal-breaking. The evidence in this area tells something of a mixed tale where the A8 is concerned. Look at the Warranty Direct Reliability Index, where the average age of the A8s in the survey is about five years old, and the news doesn’t look good. 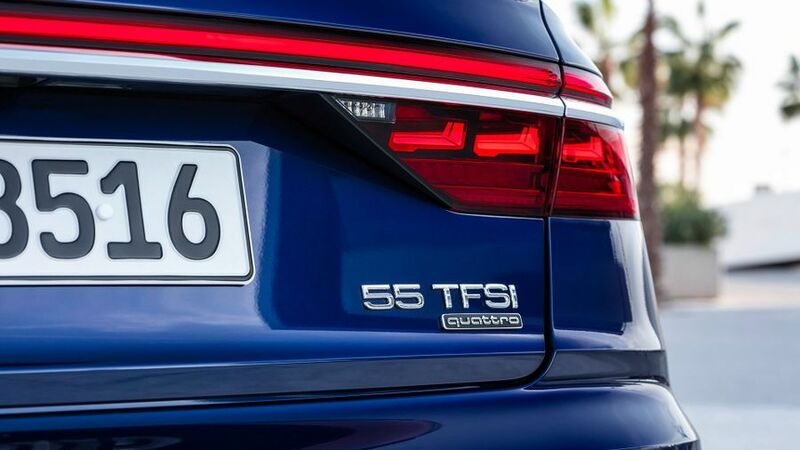 As an individual model, the A8’s score is about as low as it’s possible to get, and Audi sits disappointingly close to the bottom of the manufacturer rankings. However, the owner reviews on our own website are much more positive, with the vast majority of owners reporting a largely trouble-free ownership experience. The A8 hasn’t been crash tested by the experts at Euro NCAP yet, but with the amount of safety kit it has, we’d be staggered if it didn’t achieve a maximum five-star score. Along with all the airbags and traction aids you’d expect, the standard roster includes autonomous emergency braking, an automatic high-beam headlamp function, camera-based traffic sign recognition, lane-departure warning and a system that brings the car to a standstill if it suspects the driver is no longer conscious. In fact, these are just a few of the driver assistance systems that are available. Get busy with the options list, and you can have up to 40, which is pretty staggering. No less staggering is the fact that the A8 is the first production car that meets the standards for Level Three autonomous driving. What does that mean? Well, like with less advanced systems, the A8 can take care of the steering, throttle and brakes while you’re pootling along in traffic up to a certain speed; but, while other cars require the driver to pay attention at all times, the Audi is deemed capable enough that you can do something else entirely, like watch TV or check your emails. In theory, that is, because this level of autonomy is not yet legal anywhere in the world, and it’s not clear when it will be. As a result, you’ll have to wait a while for this functionality to becomes usable, even if you pay the extra to specify your A8 with the functionality now. What’s more, we’ve not yet had the chance to try it out, so we can’t tell you how well it works. Unlike many cars, the A8 doesn’t really have trim levels as such. The main difference between the versions is the engine you get, and the level of equipment remains fairly constant. The standard roster includes two-zone climate control, heated and cooled front seats, leather upholstery, a powered tailgate, keyless entry, LED interior lighting, wireless phone charging, front and rear parking sensors with a rear-view camera, adaptive cruise control with stop-and-go function, sat-nav, DAB radio and a DVD player. On top of the extra space, going for the long-wheelbase version also earns you four-zone climate control, heated rear seats and electric sunblinds, plus a touch-screen remote to control it all with. Of course, pretty much all A8s will also be loaded to the nines with optional extras, and there’s a dizzying array to choose from that’ll quickly escalate the cost of your car to similarly dizzying levels. Choices include bigger wheels, a TV tuner, a 360-degree camera, rear-seat entertainment screens, night vision, a panoramic roof, massaging seats and a rear foot massager. That’s on top of all the clever suspension and autonomous driving kit, which is also optional. Because you want your luxury limousine to be as technologically advanced as it possibly can be. Yes, you’ll have to pay extra for most of the really clever stuff, and in some cases, you’ll have to wait an unspecified amount of time before the law catches up with the technology and allows you to use it. 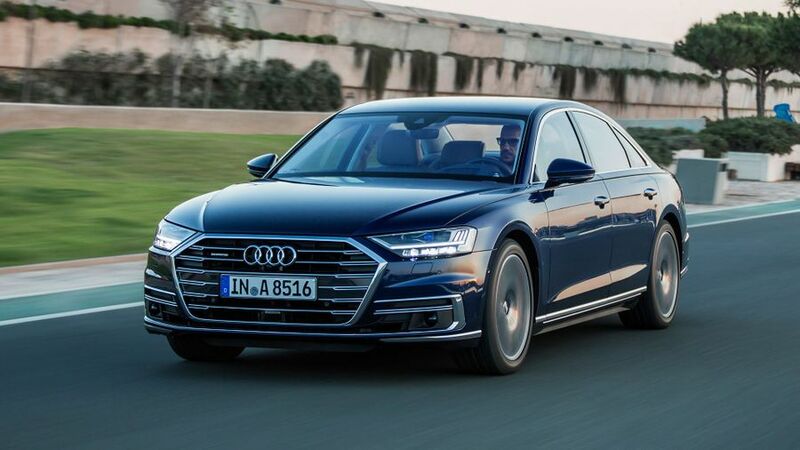 However, there’s no denying the technological achievement that the Audi A8 represents; and, even in its basic form, it’s an excellent car and a worthy contender for the BMW 7 Series and Mercedes S-Class.